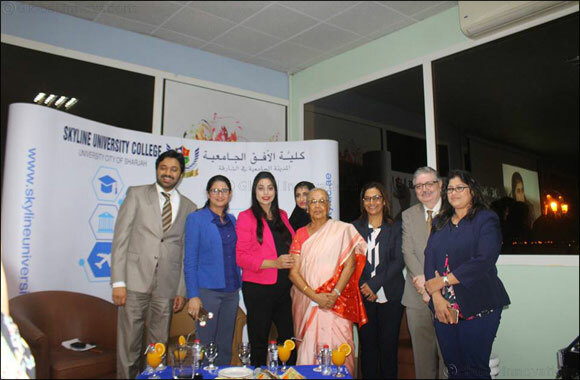 Dubai, UAE, December 5, 2017: Skyline University College in cooperation with DANUBE Group has organized Woman of Substance: A Panel Discussion on Women Empowerment on November 27, 2017, at SUC Campus. The panel discussion was aimed at raising awareness on the obstacles women are experiencing today as well as to encourage them to make their own decisions, stand up for themselves, and start believing in their power to make a change in the society. SUC Assistant Professor Dr. Kakul Agha briefly introduced the topic to the audience before the panel discussion and acted as the panel moderator of the event. The distinguished panelists were three of the most inspiring women in the UAE today namely: Dr. Zulekha Daud, Managing Director of Zulekha Hospitals; Dr. Sana Sajan of DANUBE Group’s Danube Welfare Center (DWC); and Ms. Hessa Taher of Sharjah Entrepreneurship Centre (Sheraa). Dr. Kakul also brought up the obstacles that women are encountering today and Dr. Sajan advised students to set aside the barriers that hinder them to be empowered and start standing up for themselves. Woman of Substance is an annual event of SUC to provide a platform for women to address the challenges they are facing and a venue to gain knowledge from empowered women in the UAE today.